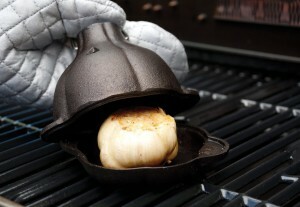 A cast iron garlic roaster is a great way to cook perfect roasted garlic indoors or outdoors. A cast iron garlic roaster might seem a little much when aluminum foil works perfectly well for roasting but try it once and you’ll be hooked. 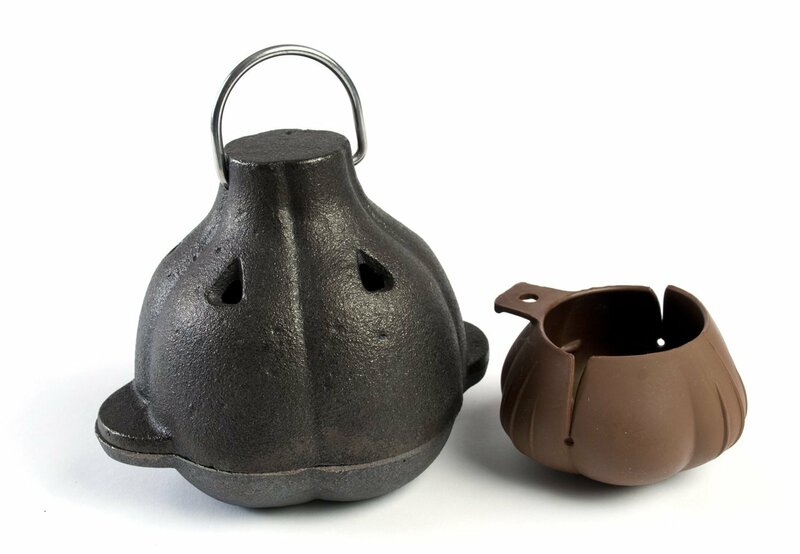 The Charcoal Companion line of products gets raves and their Charcoal Cast Iron Garlic Roaster & Squeezer Set is no exception, with lots of glowing reviews at Amazon. The idea is pretty simple: prep your bulbs for roasting and then simply place them in the cast iron garlic roaster and pop the lid on. The garlic variety you’re working with will determine how many heads of garlic will fit, but in general you’ll be able to fit one large bulb, 1-2 medium bulbs, or 1-3 smaller bulbs. This roaster works equally well in the oven or on the grill, with minimal clean-up required when you’re done. Cast iron cookware will last forever if properly taken care of so if you roast a lot of garlic in foil this cast iron garlic roaster will pay for itself in just a few years. Roasting garlic in a cast iron roaster provides the same great taste with minimal waste and clean up time. An added bonus is that you can use the Charcoal Cast Iron Garlic Roaster to roast onions, peppers, and other vegetables as well. You’ll get that nice browned effect that quality cast iron produces and free up other pans or trays that you currently use to roast garlic in. Aside from practicalities, cast iron garlic roasters look great in your kitchen or on the grill, evoking nostalgia of simpler days when food was food and cooking was done right before Teflon coatings and GMOs came onto the scene. The Charcoal Companion brand has been around for years, offering a wide range of grilling products. This cast iron garlic roaster comes from a quality operation and not some fly-by-night operation in China selling flimsy knock-offs. This cast iron roaster is a great gift for any garlic enthusiast, as roasted garlic is one of the easiest and most popular ways of enjoying fresh garlic. Get the Charcoal Companion Cast Iron Garlic Roaster & Squeezer Set at Amazon now for just $21.43 for a limited time – Click to buy! It’s also a perfect gift for Dad on Father’s Day — as well as on any other day — or for anyone that loves garlic and cooking. The Charcoal Cast Iron Garlic Roaster & Squeezer Set checks in at just over $20 on Amazon — one of the best deals you’ll find for a roaster designed with one thing in mind: producing great roasted garlic! Slice 1/4″ to 1/2″ off the top of a head of garlic, drizzle in olive oil, add a dash of sea salt and pepper, and pop it into your new roaster. Tap your foot impatiently for about 45 minutes and then enjoy amazing roasted garlic, perfect for mixing into dishes or enjoying all on its own with cheese and crackers.